SO long as you breathe, Mercy is yours. The Holy Spirit is grieved over ingratitude for the wounds of Jesus. For a few days I have had the sense that the Holy Spirit is brooding, like brooding over creation, as if we are at some turning point, or at the beginning of something big, some shift in the way the Lord is doing things. Like we now see through a glass darkly, but soon we will see more clearly. Almost a heavyness, like the Spirit has weight! Perhaps this sense of change on the horizon is why I continue to hear in my heart the words, "Quickly! Fill your lamps!" It’s from the story of the ten virgins who go out to meet the bridegroom (Matt 25:1-13). WHEN Pope John Paul II revived the Rosary in 2003, it was not out of a sense of nostalgia. He was calling the Church to arms, to take up the spiritual and material battle raging within and from without the Church. He was urging us to call upon the greatest of intercessors–Jesus’ Mother–to come to our assistance. As one priest said, “Mary is a lady… but she wears combat boots.” Indeed, in Genesis, it is her heel which will crush the serpent’s head. IF you are not praying the Rosary yet, it is time. Then it could be said that everything in between–the steps leading up this Blessed Mountain–are the charisms of the Holy Spirit, with “prophecy” being the handrails. Prophecy “means the foreknowledge of future events, though it may sometimes apply to past events of which there is no memory, and to present hidden things which cannot be known by the natural light of reason.” (Catholic Encyclopedia). For a deeper understanding of the gift of prophecy, click here. WE PRAY “Come Holy Spirit!” So when the Spirit comes, what does it look like? The icon of this coming is the Upper Room: an infusion of grace, power, authority, wisdom, prudence, counsel, knowledge, understanding, fortitude and fear of the Lord. But we see something else as well… something the Church has often failed to recognize: the release of charisms in the Body. The Greek word Paul used for charism means “favor” or “benefit.” These include the gifts of healing, speaking in tongues, prophecy, discernment of spirits, administration, mighty deeds, and interpretation of tongues among others. Let us be clear: these are charismatic gifts–not “the Charismatic’s gifts”. They do not belong to a single group or movement within the Church, but belong in proper to the whole Christian community. Too often, we have sent the gifts into the church basement where they are safely hidden in the confines of the prayer meeting of a few. What great loss this is to the community! What paralysis this has brought about in the Church! These charisms, Paul tells us, are for the building up of the Body (cf. 1 Cor 12, 14:12). If that is so, tell me, what happens when the human body stops moving on a hospital bed? The person’s muscles become atrophied–limp, weak, and powerless. So too, our failure to appropriate the charisms of the Holy Spirit has led to a Church which has fallen asleep on its side, unable to turn over and show the face of Christ to a hurting world. Our parishes have atrophied; our youth have lost interest; and those gifts intended to build us up remain hidden beneath the dust of our Baptism. Indeed, Come Holy Spirit–come and re-enkindle in us your seven-fold gifts and bountiful charisms, for the glory of God, the renewal of the Church, and the conversion of the world. MANY people say they have a personal relationship with Jesus. Others speak about their relationship with the Father. This is wonderful. But how many of us have a personal relationship with the Holy Spirit? The Third Person of the Holy Trinity is just that–a divine person. A person whom Jesus has sent to be our Helper, our Advocate. A person who loves us with a burning love–like a tongue of fire. We can even “grieve the Holy Spirit” (Eph 4:30) because of this ineffable love. 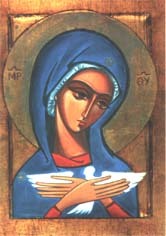 But as we enter into the great feast of Pentecost, let us bring great joy to this intimate Friend. Let us begin to speak with the Holy Spirit, heart to Heart, lover to Lover, opening our spirit to Spirit, knowing that because of the Father’s love, because of Jesus’ sacrifice, we now live, move, and have our being in this most Holy, Divine, and wonderful person: the Paraclete–who is Love itself.